Founder, Russell Cuoco opened a small dry-cleaning business in his family's garage in 1930 as Russell's Cleaners. His standard of excellence has kept the business in high demand for 74 years. Russell Cuoco's successor, son-in-law, Richard Bauer continued to work and maintain the quality of excellence. The goal of improving quality through specialization led the Bauer family to separate the household and garment cleaning divisions. In 1996, Richard Bauer's children, Andree and Eric, opened a separate company, Russell's Cleaning Services, which broadens its household cleaning services into a new area - fire and water damage restoration. Over the years, the business has expanded from a small dry-cleaning establishment to one of the most diversified cleaning businesses in the city. 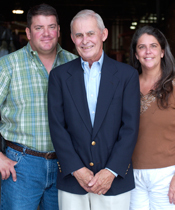 Besides their attention to quality and customer services, Russell's has been consistently successful over the years due to the diligence and perseverance of the members of the Bauer family. Russell Cuoco believed in utilizing high quality machinery and state-of-the-art techniques to meet the highest standards of customers. The Bauer family in following that philosophy is currently up-grading the plant equipment to meet the demands for the 21st Century. As an added service, Russell's purchased the long established New Orleans based Klein's Rug Cleaning Service. The well known location of Russell's in the Mid-City location unfortunately succumbed to the infamous Hurricane Katrina. Within a month of the hurricane Russell's was back in business now located in Metairie, Louisiana. However, the new Airline Drive location is what has secured Russell's as the only shop in the city to offer full-service area rug cleaning due to the specialized equipment. "What makes our business stand out from the competition is friendly, old-fashioned service, honest advice and genuine concern for our customers," says Russell's Cleaning Services President, Andree Bauer.